Cadel Evans posted on Twitter today this new photo of 3-time Tour de France Lanterne Rouge Wim Vansevenant: http://twitpic.com/3rcu5 "in his new role as 'VIP driver'. " Two-time Tour de France Lanterne Rouge, Jimmy Casper, won his second race this week, the 50th GP de Denain. That launches him into a commanding lead in the cycling French Cup series. Chapeau! 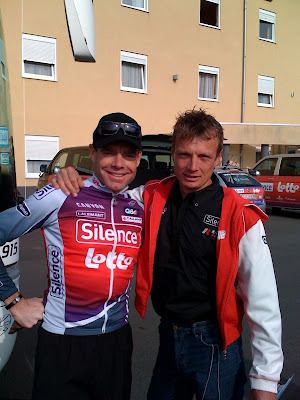 Jimmy Casper, the two-time Tour de France Lanterne Rouge (2001, 2004) secured a victory over the weekend at the Paris-Camembert race. He now rides for Besson-Sojasun. Congratulations! Michael Friedman, aka "Meatball", riding for Garmin-Slipstream, was the Lanterne Rouge finisher of the grueling Paris-Roubaix race this year, coming over the line in 99th place. He's a Pittsburgh native and twice a winner in the Team Pursuit at the USA National Championships. Here's a photo that illustrates how he must have felt. Eighty-eight other starters failed to make it to the finish line of the race nicknamed "Hell of the North". Well done, Mike!